Mathieu Schmitt is a recent business graduate and started Mr. Robotics with Guillaume, a mechanical engineer just graduated from the Supmeca school, and current Industrial Science student Olivier. In January 2017 they decided to build a tool that could teach programming and robotics at a basic level but also allow for expansion up to the expert maker level. Their current project Robby is a robot designed to evolve as the user’s programming and building skills evolve, and running a Kickstarter campaign to fund its first units. The robotics system breaks down into three phases: first the user chooses omnidirectional wheel drive or two wheel differential drive. Then modules and sensors are added to the body. Finally the robot is programmed using either Blockly or C++ text programming. The beta version of the robot’s Blockly interface is currently on the team’s website. 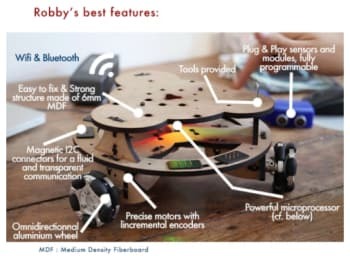 Users can communicate with Robby through USB connection, Bluetooth and WiFi. An ARM Cortex-M4 32bit 120 MHz processor is used and their microcontroller is based off of Teensy 3.5 and called the BRAINZY board. Currently there are two sensors developed for the system, an ultrasonic sensor and a light sensor. 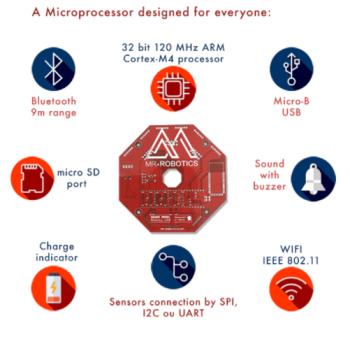 The system has room for six separate sensors and the group is working on developing more applications and also encourage their users to create new open source applications on their own. Robby is joining a very crowded field of tools developed for people who want to learn robotics and programming. The big draws here are the scalability and commitment to open source programming and development. This is a project that will be great to revisit in a year and see which additional sensors and applications have been developed for the system by the creators and the user base. The campaign ends on March 18 and if successful first units are expected to ship in August 2018.